Do you want to be part of an exciting 21st century heritage conservation project? Are you looking for an interesting and creative volunteer role? 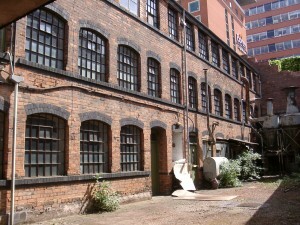 bITjAM Ltd is working with Birmingham Conservation Trust on a project to develop interactive digital tours of The Coffin Works in Birmingham, ready for its opening to visitors in 2014. We are currently recruiting for a volunteer to work with us to develop a 3D digital model of Newman Brothers Coffin Fitting Works. This incredible Grade II* listed metal working factory, built in 1892 produced coffin furniture for over 100 years. Its restoration will begin in a couple of months. The 3D model we want to produce includes the buildings, fixtures and fittings, and surrounding area (the Jewellery Quarter). If you have an interest in architecture, heritage and conservation work, and have the basic digital skills to use Google sketch up, then you may be the person we are looking for! As well as initial training in using Google Sketchup you will be given access to online tutorials to help with the project. However, we will need you to be able to learn quickly, work using your own initiative and be able to travel easily to Stoke-on-Trent and Birmingham. We will provide reasonable travel expenses, but this volunteer role is home based, so you must have access to a PC or laptop. We will also need to have the 3D model completed by the end of June. If you are interested in this exciting new volunteering role for Birmingham Conservation Trust and want to find out more, please contact Carl Plant at bITjam Ltd by email: carl@bitjam.org.uk or phone: 07595 692120. Almost every day the Coffin Works project gets more exciting!